It is proposed to submit a Memorandum to Hon’ble Finance Minister conveying our views and demands for inclusion in General Budget 2016-17. Draft Copy of the Memorandum is given below. Please suggest additions/Modifications, if any, required, within two days. It is now more than four months that the Government has held out the assurance to the leaders of NJCA that they would revisit the minimum wage determination and the consequent fitment factor of the 7th CPC. The understanding reached on 30th June, 2016 was that the Government would set up a high level committee to examine the complaint made by the employees organizations to the effect that the 7th CPC had not adhered to the norms of the Dr. Aykhroyd formula. The said decision was in the backdrop of the NJCA’s strike notice which was served on 9th June, 2016 and its resolve to go ahead with the said decision to organize the indefinite strike action from 11th July, 2016. The employees had realized that contrary to the impression, the 7th CPC imparted to the leaders during their interaction with it, its final suggestions were extremely nugatory and were the product of pressure exerted by the Government on the Commission .at the fag end of its functioning. They found that the minimum wage determined by the commission was in violation with the agreed principles of wage determination in the case of civil servants, it had recommended the least quantum increase in the wages in comparison with all the earlier Commissions; it had reduced the rates of various allowances without any valid rhyme or reason; it had abolished certain allowances despite the continuance of the extra functions/circumstances for which those allowances were originally granted; had abolished all interest free advances; had withdrawn the existing benefits, perks and privileges which had originally granted to a section of the employees and officers taking into account the peculiarities of the assigned jobs to them etc. Naturally the disappointment that arose from such negative attitude of the Commission paved way for anger and consequent agitation, creating thus an atmosphere of confrontation. The setting-up of a committee under the Chairmanship of the Cabinet Secretary was, therefore, seen as a step in the right direction. After about six months deliberations, the Committee seems to have given a report to the Government content of which was not made public. However, during its inter action with the Staff Side, the Committee had given the impression and indication that it would make changes to the quantum of minimum wage and fitment factor and the Fixed Medical Allowance of the Pensioners would be suitably amended. The Committee intimated the staff Side that the Government would set up separate Committees for allowances and advances to effect a relook into the matter in consultation with various nodal departments of the Government of India. In other words, the Government through the Committee headed by the Cabinet Secretary conveyed that it would create a conducive climate for a fruitful negotiation and settlement. The 29th June proclamation in the form of Notifications was a bolt from the blue . Was it designed to discredit the NJCA leadership or snub the Committee headed by the Cabinet Secretary or reflection of the arrogance of the party in power was not discernible. It was in that background the NJCA met on 30th June and decided unanimously to go ahead with the preparation for the indefinite strike action. Undoubtedly the Government’s attitude had added fuel to the fire of anger and the leaders especially at the gross root level ,who had hoped that the Government would avert the situation of confrontation welcomed the decision of the NJCA wholeheartedly. The late night discussions, the group of Ministers had with the NJCA leadership on 30th June, 2016 and the offer of a negotiated settlement of the core issues through the setting up of a high level committee was considered a step in the right direction by the NJCA leadership while accepting the offer of talks, though the State level leadership in quite a number of states felt that the Government was indulging in chicanery. The time frame of six months for the Committee to complete its deliberations and make suggestions to the government on the core issues was over technically on 6th November, 2016 . The National Secretariat of the Confederation met and rightly decided to chalk out a series of programmes of action, the second phase of which would be carried out on 15th June, 2016 in the form of a massive march to the Parliament house. These programmes are to culminate in a strike action. Isolated action, the Confederation is fully aware is not capable of bringing about compulsion on the Government to revise their decisions promulgated on 29th June, 2016. Confederation is confident that the Defence and Railway organizations who are the predominant partners in the NJCA would realize the gravity of the situation and enliven the NJCA and spearhead the movement to its logical end. Isolated ventures will not be avoidable in certain exigencies, when demarcation in action becomes necessary so as to maintain the character and ideology of the organization and confidence of its members becomes paramount. (f) if not, the reasons therefore? 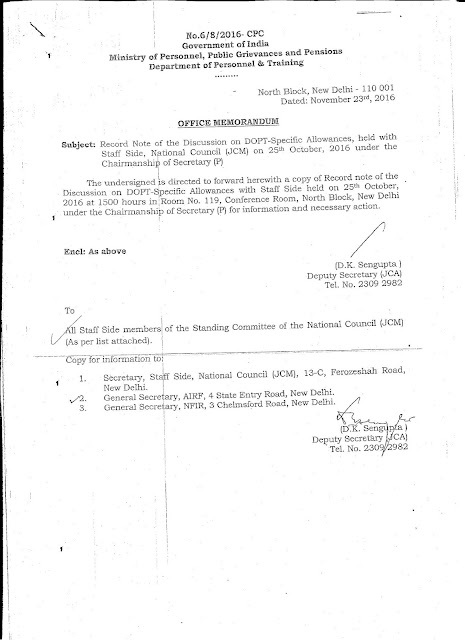 RECORD NOTE OF THE DISCUSSION ON DOPT-SPECIFIC ALLOWANCES, HELD WITH THE STAFF-SIDE, NATIONAL COUNCIL (JCM) AT 3.00 P.M. ON 25.10.2016 UNDER THE CHAIRMANSHIP OF SECRETARY (P). 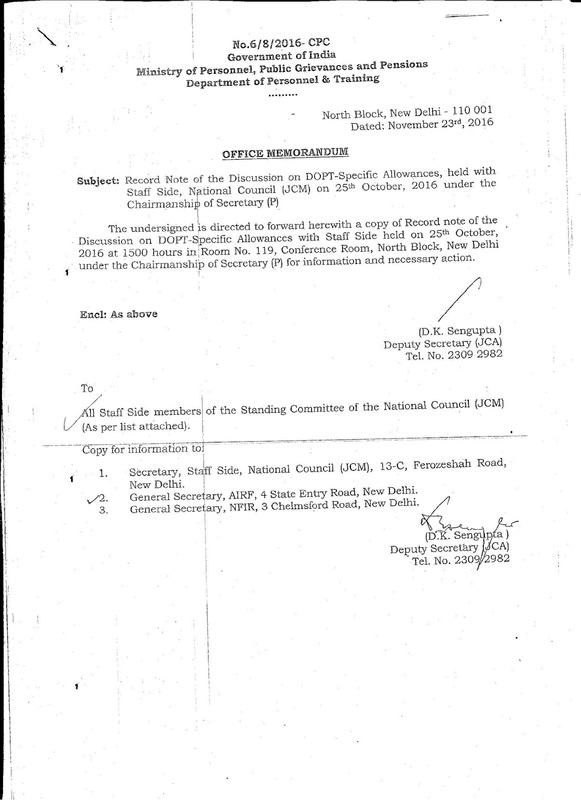 A discussion on the DoPT-specific allowances with the Staff-Side National Council (JCM) was held at 3.00 p.m. on 25.10.2016 under the Chairmanship of Secretary(Personnel) in Room NO.119, North Block, Delhi in compliance with the direction contained in the minutes of the 2nd meeting of the Committee on Allowances held on 01.09.2016 that every Ministry/Department should firm up its views/comments on allowances relating to the Ministry/Department after holding discussion with their Staff Associations. 2. List of participants is at Annexure. 3. At the outset JS(JCA) welcomed all the members of the Staff side of the National Council of JCM to the discussion on department specific allowances. JS(JCA) informed that in the second meeting of the Committee on Allowances it was decided that all the department specific allowances will be discussed with the JCM. After a brief introduction it was decided to discuss the following department specific allowances on which has received the comments for Staff-Side. 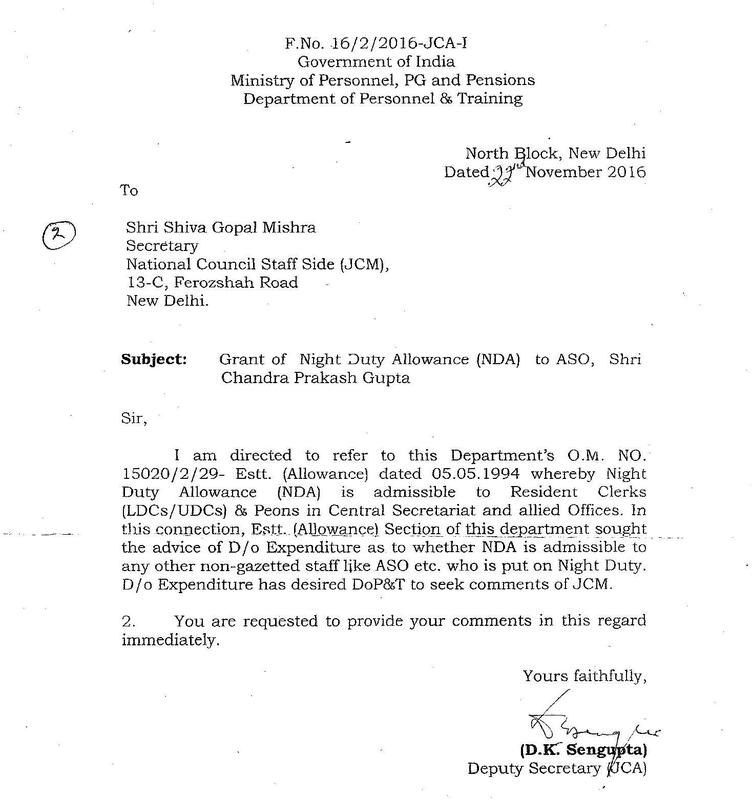 Staff-Side has pointed out that the Night Duty Allowance (NDA) is still being paid at the 4th CPC rate. Even though there is a Board Of Arbitration award in favour of employees that from 01.01.1996 it should be given in the 5th CPC pay scale, the government did not accept the arbitration award and even today employees are getting it at the same rate as it was prevalent during the 4th CPC period. In the Ministry Of Defencc a lot of litigation had taken place and the matter went up to the Supreme Court. Hon’ble Supreme Court directed that it should be paid on the basis of the actual pay drawn and that NDA should be revised w.e.f. 01.04.2016 at the 6th CPC pay scale which has been implemented by the government. However, the audit authorities came up with an objection that there is a ceiling for it which has been objected to by the Staff-Side. Apart from that, the 7th pay Commission has recommended that it should be worked out with the actual pay of the employee being are criterion. However, in spite of that, except for the Ministries of Defence and Railways, employees working in other Ministries/Departments are getting it at 4th CPC rate. Thus, the absence of uniformity on this allowance across Ministries/ Departments is Very glaring which, according to the Staff-Side, is a principal source of litigation and will continue to remain so. Therefore, the Staff-Side has suggested that an early revision of the without ceiling, and on the basis of the actual basic pay, and extending it to whoever is asked to do night duty will go a long way in reducing litigations in the future. Staff-Side has pointed out that there are two types of over time duty. One is covered under the Factories Act, 1948, and the other is for the office staff. In the first case, since it is a statutory obligation, the pay Commission has not recommended anything on it. But for those Central Government employees who are not covered under the statutory provisions of the Factories Act, OTA is paid at a single rate of Rs.15.85/- Only and, that too, fot the first hour immediately after the scheduled office Closing time, it is Nil. In case of OTA there is also an arbitration award from 01.01.1996 that it should be at par with the 5th CPC pay scale. However, neither it has been implemented not have the rates been revised. The Staff-Side has stated that if an employee is asked to word after office hours, the rate of OTA Should be as per 7th CPC Pay Scale. Staff-Side is of the opinion that overall means working after office hours, and asking an employee to work beyond office hours automatically entitles him/her to this allowance. The Over Time rates should also be above the normal level. It was pointed out by them that as per 7th CPC. an is paid @ Rs.75/hour; whereas overtime allowance is @ Rs.15.85/- only. Even an outsider employed on casual basis is being paid hourly wages which are more than OTA. The Staff-Side is strongly of the view that if government is deploying a person on overtime work then he has to be paid at least according to the rate of salary which he is getting. Staff-Side has informed that the 7th CPC recommendation on its abolition is based on the fact that in most of the offices today salary disbursement is not made in cash. It is credited to the individual bank accounts. But cash transactions do take place in certain offices like the Post Offices where cash handouts are made under the Mahatma Gandhi National Rural Employment Guarantee Act. PLI is also another example. Therefore, if it is stopped all of a sudden, no person will show interest in working as cashiers and take the additional responsibility of handling huge amounts of cash. Therefore, the Staff-Side has contended that till all cash transactions are ehminated, CHA should continue. It was also pointed out by them that this allowance depends on the amount of cash transaction; when the volume of cash transaction comes down, the allowance also proportionately come down. Staff-Side has informed that the 7th Pay Commission has recommended that Persons Below Officers Rank (PBOR) should be given Dress Allowance @ Rs.10,000/- per month. There are 5 Ordnance Factories under Ministry of Defence where persons are exclusively deployed to produce special high altitude dresses for the combat forces of the army. 12000 employees are working in these 5 factories. Therefore, if a uniform rate like this is maintained, it will have an adverse impact on the quality of these high altitude uniforms and will thus jeopardise the safety of the army men and the nation as a whole. Staff-Side is stated to have already made a request to M/o Defence not to implement this recommendation. Army has also taken a stand that this will result in substandard or sub quality material So this recommendation on the Dress allowance for PBOR should not be implemented. As far as Civilian employees are concerned, it has been stated that the 7th CPC has recommended four slabs of Dress Allowances for various categories. One of the categories is called ‘others’. Whereas, in the Department of Posts there are about 75,000 postmen and Multi Tasking Staff wearing uniform. There is no mention about these postmen and multi tasking staff in any of the categories shown by the Pay Commission. If it is presumed that they come under ‘Others’, then they will be getting Rs.5,000 Whereas at present they are getting around Rs.7,000 plus washing allowance. As such a separate category should be there for postmen and MTS also and the allowance should be Rs.10,000/-. Staff-Side has also drawn attention to the Dress Allowance with respect to the Nursing Staff. It has been stated that earlier also Nursing Staff were not given normal washing allowance or dress allowance considering the importance or the peculiar conditions prevailing in hospitals. Now they have also been bracketed in the general category. They were getting Rs.750 as Uniform Allowance and Rs.450 as Washing Allowance per month. Now there is no separate category that has been given to them. For them a different dispensation was made taking into account their special requirements because they work in such an environment where their uniforms require regular washing entailing a substantial expenditure. As these have not been accounted for in the 7th CPC, the nursing staff should have a special dispensation, as is strongly felt by the Staff-Side. The Staff-Side has informed That Ministry of Defence is engaged in arms and ammunitions manufacturing etc. In the process of manufacturing them, the staff engaged for this purpose, have to handle hazardous chemicals, acids and so many Other poisonous combinations. Cabinet has approved 45 risk operations pertaining to Defence civilian employees. Apart from that, because of the technological developments taking place fast and as the requirement of the armed forces is increasing for getting modern equipments, ammunitions and explosives, new risk operations have also come into existence of which Ministry of Defence is aware and have recommended also accordingly. In spite of this, the existing Risk Allowance has been abolished by the Pay Commission. It has been pointed out by the Staff-Side that it has not been subsumed under the risk and hardship matrix. Rather it comes in the abolition list. In no matrix are the risk operations of Defcnce civilians are covered. Staff-Side has informed that they have discussed this with Defence Secretary and Defence Ministry is going to recommend in favour of its inclusion in one Of the matrix. In response to the query of Secretary, DOPT as whether the activities which have been considered to be risky have all been identified, Staff-Side has clarified that it has been identified by a high level committee and approved by the Cabinet, 45 risk operations have been identified and approved. But within a period of 2 decades, lot of new ammunitions and new explosives have come in the arsenal, alongwith a lot of hazardous chemicals and acids. So, M/o Defence has again appointed a committee and they have identified that all these ate additional risk operations over and above the 45 identified, where Defencc Civilian employees are actively involved. But the Pay Commission has abolished Risk Allowance. So this has to be incorporated in onc of the risk matrix. On Family Planning Allowance, the Staff-Side has stated that since the Government has not changed its Family Planning policy, the allowance should be continued, At least in the case of those people who were getting it they should continue to get as they have fulfilled all conditions when the allowance were granted. Otherwise be drop in their emoluments. (ii)some of the aspects in the rank structure unique to Defence Forces. two stages in Level 13A (Brigadier). 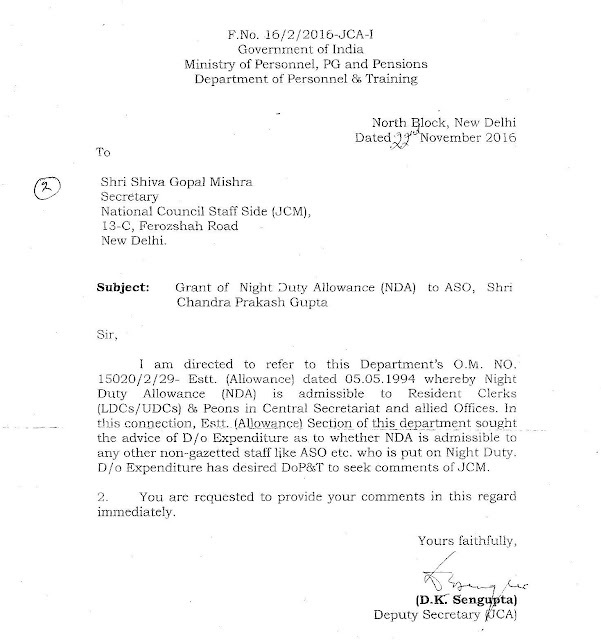 As and when issues regarding anomalies in the pay of defence personnel are brought to notice, the same are examined by the Government, on case to case basis. This information was given by Minister of State for Defence Dr. Subhash Bhamre in a written reply to Shri Sultan Ahmed and others in Lok Sabha today. (c) whether the benefit given in the 7th CPC is one of the lowest in all time ever since the Government had been implementing the recommendations of CPC and if so, the details thereof? (a) to (c): All Government employees have got a financial benefit of at least 14.29 per cent by way of revision of salary after implementation of Seventh Central Pay Commission (7th CPC). The increase in pay as recommended by the 7th CPC is based on the detailed deliberations by the Commission keeping in view all relevant factors having a bearing upon the prevailing circumstances, which has been accepted by the Government. 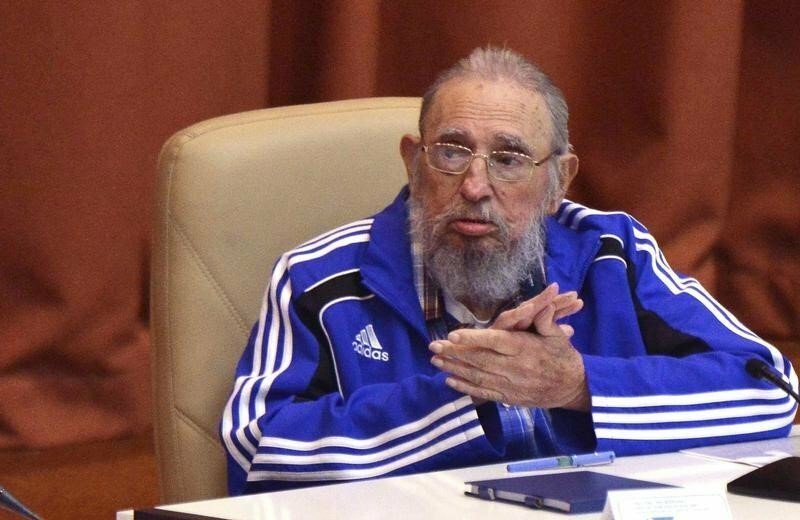 International Revolutionary leader Fidel Castro No More! Comrade Fidel Castro at 90 has breathed his last yesterday night on 25.11.2016! Comrade Fidel liberated the Latin-american 'Cuba' in 1959 through a revolution and established the first socialist system in the continent. Under his able leadership 'Cuba' not only developed as a socialist nation but defeated 60 years of USA's economic blockade. 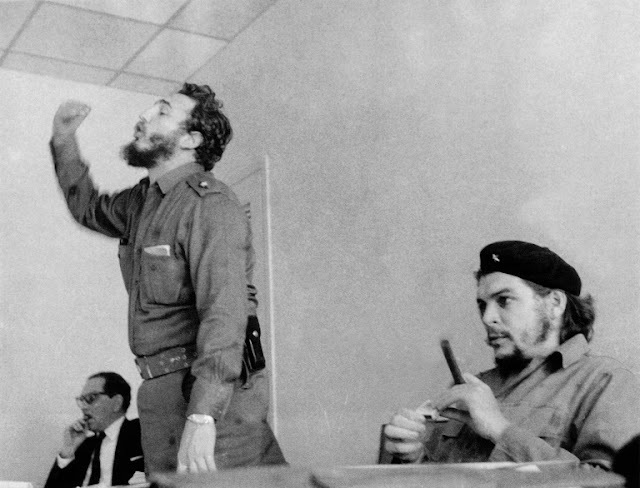 Numerous attempts by CIA to assassinate the revolutionary leader were foiled successfully by Fidel. Fidel is the symbol of defiance against imperialist hegemony; icon of revolutionaries of the contemporary world; icon of Latin American revolutions in many countries; imparting confidence in socialist ideals even after the collapse of socialist world! In fact it is to his credit that the USA came down to establish normal ties with Cuba recently, while Fidel was still alive. A visionary leader of working class is no more! Confederation dips its banner in honour of this international revolutionary leader. - M.Krishnan SG Confederation.